We offer basic facilities for your overnight accommodation: a well equipped kitchen; indoor toilets; electric heating, hot water and drying rack; and newly fitted electric shower. 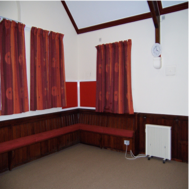 The Hall can provide up to 10 camp beds or sleeping mats in a single room. You should bring your own sleeping bag, towel etc. 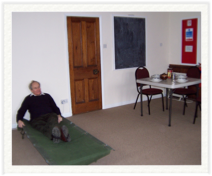 The charge for staying in the Village Hall is £12.00 per person per night for a bed and minimal breakfast (cereal & coffee/tea), or £15 for a bed and full English self-cook breakfast plus cereal, toast etc. You are advised to contact 01759 304735 or 01759 301931, or email: accommodation@millingtonvillagehall.org.uk to ensure the date you want is available. You will then be asked to complete the Overnight Booking Form.doc. Cheques to be made payable to ‘Millington Village Hall’ please. You can dine at the pub - the Gait Inn - most nights and the Rambler’s Rest tearooms are open for lunches Thursday to Monday and for dinner on application.